It might be the sense of belonging or security, or it might be a nest for hatching offspring. It may be cluttered with possessions or memories, or be the one house in the street where love lives. Whatever the case, most – but certainly not all – people seem to have a sense of home. 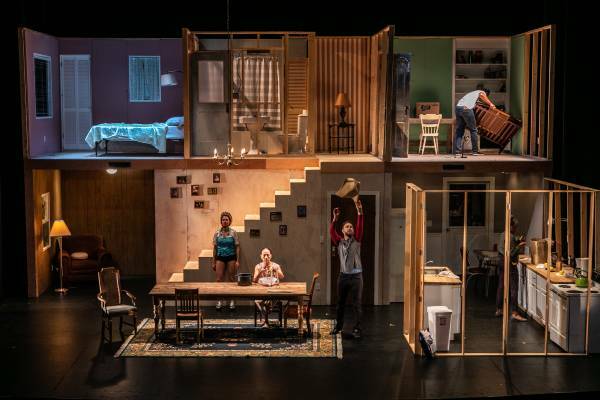 American theatre-maker Geoff Sobelle must be among them, given he emphasises his show’s title with capital letters: you wouldn’t bother to shout “house” or “the country where I used to live” in that way. HOME is a kids’ show for grown-ups. It’s a wonder-world of illusion and enchantment; of slapstick gags and theatrical flourishes; of audience participation – loved by kids, abhorred by adults – on a prodigious scale. It also carries metaphorical implications, although, whether by intent (to avoid weighing down the elfin lightness) or poor dramaturgy, these are kept cloudy: layers of meaning that won’t swamp you, but for which you might choose to reach. It begins with an empty stage on to which Sobelle drags a hinged wooden frame. The prosaic process of his stapling plastic sheets to this frame dampens expectations, so the subsequent feats of illusion are all the more surprising and enchanting. The kid inside each adult still loves a little magic, after all. In no time at all a two-storey house – or home – exists, the building process replete with sight gags worthy of Eric Sykes’ The Plank. The dialogue-free show is occasionally serenaded by Elvis Perkins singing and playing his own songs (which air on a bandwidth between Dylan and Cohen), or by recorded tango, or later a miniaturised, live, New Orleans marching band. Despite the lack of narrative or dialogue, a loose three-act structure emerges. The construction constitutes the first act, while the second sees the cast of six inhabiting and continually reinhabiting the place in different roles, as though time does not exist, and all the edifice’s occupants across multiple years cohabit simultaneously. Delightful pieces of illusion invigorate this section, as do amusing snippets of ensemble choreography (by David Neumann) correlating to the tango music. The comedy here has echoes of Jacques Tati, although the ideas can be stretched quite thin. Audience participation constitutes the third act, as cast members enter the auditorium and lead one hapless or happy victim after another to the stage, until some 20 audience members swell the numbers of what has become a rollicking house party, with bottles of red, nibbles, music, dancing and laughter. The audience members must be subtly cued throughout, so no one blundering into the theatre at this point would tell a cast-member from a rope-in. Meanwhile the nature of the party’s celebration evolves from birth to birthday, graduation, wedding, Christmas, New Year’s Eve and finally a wake. 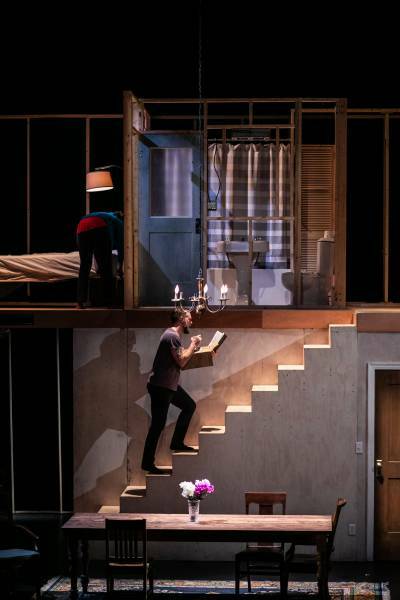 Gradually the audience members dissipate, except for two, who, in the only significant use of spoken word, tell us of their first homes, and then the house is stripped of its possessions, until it is inhabited only by the memories that haunt all homes. Directed by Lee Sunday Evans and designed by Steven Dufala, the show has repetitive flat-spots alongside its undeniable enchantment and entertainment. The sheer sweetness of it can feel flighty and unfulfilling, however, as if you’ve consumed a three-course dessert and no main. It lacks either the surreal imagery of, say, Slava’s Snowshow, or the intellectual rigour of Simon McBurney’s visual theatre. But if you want to give your inner child a light night out, HOME is the place to be.